There might be a pretty good opportunity for breaking news coverage next week as the midterm election results start to come out. Presenting your coverage online, here’s the big thing to think about: Where’s it going to go? Is it time to finally use the Breaking News Ticker? Add headlines to it throughout the day as you gather small tidbits of information. Does all your coverage go in the widget for News? But is that underselling its importance? It probably is, only because there’s so much you can do to showcase it by manipulating the layout of your homepage — for even just that single Tuesday in November. Go create a Design Snapshot right now to save the current, everyday layout of your homepage, so you can quickly revert back to it after Election Day. Once you create that Snapshot, start plotting out the Breaking News “template” of your homepage for Tuesday. Sketch it out and take inspiration from other places. Designers at The New York Times have been thinking about their breaking news template for months — you can bet they’ll have a different-looking homepage, beyond the changes we did an entire podcast about, with them. 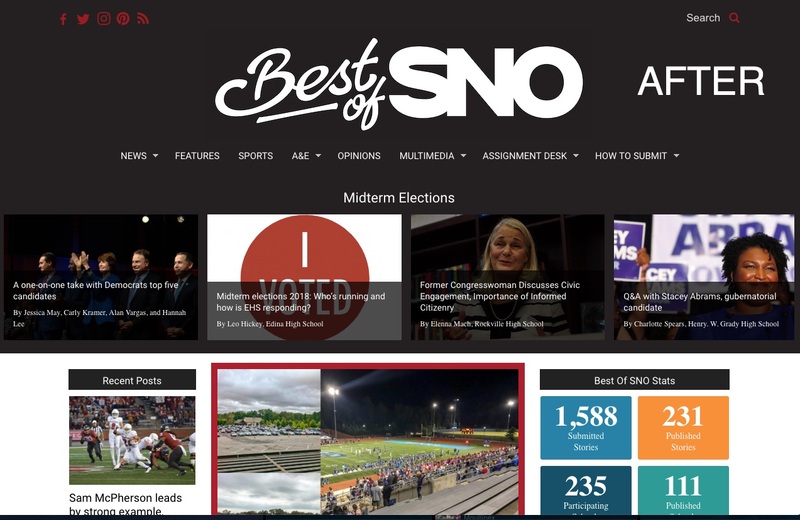 Consider, for example, the layout we’ve created on Best of SNO to showcase your midterm election coverage. Having a number of versions of our header gave us the flexibility to flip from a white background to black one to emphasize the top section of the homepage where we were going to showcase your work. But maybe that’s not realistic for your publication — that’s OK, you can do everything else. We created a brand new category, titled “Midterm Elections,” (call it whatever you want) to file all the content into. All that is being pulled into the SNO Story Carousel widget at the top. Maybe you’ll change the displaying category in your top carousel or grid to “Midterm Elections” (again, call it whatever you want) for a day or two only. Or, maybe you’ll use the Above Header Full Width widget area instead, keeping the new large, content-displaying widget away from the existing one. Maybe you’ll use the Immersive Splash Page to showcase your one, big election story. Or maybe you’ll keep it so simple and display the stories from your new category in a Category Display Widget, but helping it to stand out by customize its widget styling. The opportunities are almost endless and not just limited to Election Day. Do this the week of the state championship football game. Do this the week of Homecoming. Do this over the holiday break. We hope to see you guys mixing it up next week. There’s no bigger draw for increased readership than an event like this. Give those people something that makes a big impression.